"Help me to realize that my true home is not here on earth, but in Him!" A principle established in the early years of Ananda Village’s founding is to minimize the concept of personal ownership—without eliminating it — and maximizing the sense of shared, cooperative ownership — without making it the only form of ownership. 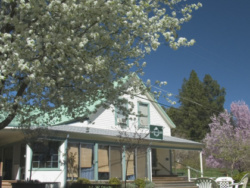 It was decided early on that the land on which Ananda Village stands would be owned, not by individuals, but by a non-profit, spiritual corporation, which is known as the Ananda Church of Self-Realization. The property as a whole is maintained and improved through community dues, frequent community workdays, and by striking a healthy balance between volunteerism and paid positions. Perhaps the most innovative expression of personal ownership at Ananda Village is the manner in which we build, fund and maintain our residential housing: The Housing Pool. 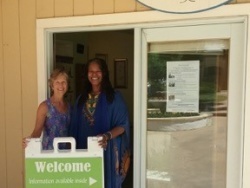 While all housing is “owned” by the Ananda Church of Self-Realization, the Housing Pool allows members to participate in that ownership in three ways. Rent: When residences become available, Village residents, regardless of whether they have contributed to the Housing Pool, can rent appropriate residences. Families usually require larger residences, and couples and single people are encouraged to live in smaller but comfortable spaces. People’s changing circumstances, and the coming and going of members from and to other Ananda communities, result in a fair amount of calls for volunteers to help load the moving van! Vest: Members can make contributions, or vest, in the Housing Pool. If the member’s contribution to the pool is equal to the value of the residence they live in, they are considered to be “fully vested,” and they pay no rent. If their contribution or “vestment” is not fully equal to the value of the residence they live in then they pay a prorated amount of rent. Steward: Members who are “fully vested” can chose to become Permanent Stewards of a particular residence. Stewards generally take a great interest in maintaining and improving the residences they have chosen to live in. Funding for new residences is achieved by community investment, or if a member wishes to contribute sufficient funds to the Housing Pool to construct a new residence. Members making such a significant contribution usually intend to live in the new residence and will often be closely involved in its design — although community input is involved. When members, for any reason, wish to withdraw their contribution from the Housing Pool, they are paid back their original contribution, plus a proportional amount of the overall value which housing at Ananda appreciated since their contribution. Their Housing Pool contribution, plus appreciation, is often too large to be paid immediately. Instead they are paid in agreed upon installments over a number of years. The Housing Pool has provided Ananda Village with a way of creating and providing housing that is flexible enough to allow residences to change hands quickly and easily without creating the usual “home sale” event with its attendant costs and potential for disagreements over the price. Members’ housing pool contributions do appreciate over time in accordance with the general index of local home values, thus providing contributors to the housing pool most of the usual investment benefit of home ownership. Yet the Housing Pool also accentuates the shared community value of cooperation.